. 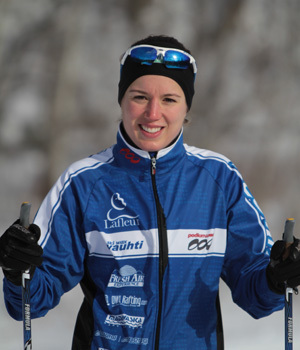 : Vesta Mather :: Ski XCOttawa.ca :: Skiing in Ottawa and Gatineau Park :. Vesta has been skiing since she can remember, first outside of Sudbury and then her dedication to the sport was tested on the slightly less scenic golf courses of Guelph. In Guelph, in addition to skiing with the University team, she studied dendrochronology (a fancy word for tree rings). If she could race on wooden skis, her life would be perfect! Vesta made the move to Ottawa last year and it really paid off for her skiing results. At the National Championships she had multiple top 30 finishes finished 3rd at an Ontario Cup and 17th at a NorAm. Her favorite food is beaver tails and she makes a mean lasagna. This year she hopes to become more competitive and work on her consistency. She hopes to come top 20 at Nationals. "Infinity Ski Poles - Lighter, Stronger, Faster, Better!"